"I can feel what's going on inside a piece of electrical equipment." Though others came before him in the realm of electronic instruments, Robert Moog remains the best known and the most influential. Creator of analog synthesizers used by artists ranging from Wendy Carlos to Rick Wakeman to more modern proponents like Devo, Stereolab, Nine Inch Nails, and Air, Moog's creations really were a landmark in modern music. With that in mind, this documentary seeks not to explore that impact but to take a look at the man himself, through visits to musicians and Moog users to those who helped Moog establish the synthesizer within the music world. If you aren't a Moog enthusiast or a fan of one of the performers seen in the documentary, you might not get much out of this. Personally speaking, I'm a big Stereolab fan, and their appearance in the film is a brief concert clip, where we see a Moog used. No explanations, no interview, just the footage (although there's more in the deleted scenes). So it goes with some other performers, where we're shown the Moog in action, though without much context or illumination. The major omission in terms of Moog users is Wendy Carlos, whose Switched on Bach album did a great deal to spur mainstream acceptance of the instrument. Moog mentions the album very briefly, and director Fjellestad does at least explain in the liner notes that Carlos was repeatedly asked to particpate, but refused vehemently, for unknown or unexplained reasons. The performers aside, the star of the show is Moog himself, and he chats amiably with musicians about the synthesizer, and discusses his own thoughts and beliefs about his work. He gets a bit New Agey and metaphysical at times. An organic gardener, he talks about his garden, but doesn't seem able to explain what attracts him to it in relation to his career in electronics. In the liner notes, Fjellestad writes that he sees Moog as "the archetypal American maverick inventor," but I didn't get a strong sense of that from the film. Moog and a couple of the folks he chats with touch on the problems they had in getting started, but most of the Moog story appears to have run pretty smoothly, judging from what was said here. Likewise, there's very little discussion of any negative reception of the Moog synthesizer. 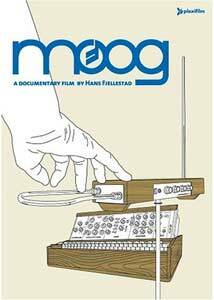 Fjellestad has made a personal exploration of Moog and his work, and that is perhaps part of the problem I had in watching the film. It's his exploration, and it wasn't always meaningful to me as a viewer as much as it might have been to him. That being said, if you're a fan of the man and his creations, then give this a look, but don't expect any epiphanies. Image Transfer Review: Moog is presented in a nonanamorphic letterboxed transfer. The film was shot in 16mm, which results in a fairly grainy picture at times. Colors look okay, but blacks aren't always tremendously solid. Overall, it's a reasonable transfer given the limitations of the source material. Audio Transfer Review: The soundtrack is presented in Dolby 2.0, and it serves the film well. The music, when the film presents it in a concert setting, sounds good. Otherwise, much of the film is interview-based, and the soundtrack does a good job of presenting it clearly. Extras Review: A decent selection of material here; Fjellestad provides an audio notebook discussing the film, with footage of himself playing a MiniMoog synth. It functions in part as a commentary, albeit a very brief one at only 09m:57s. The bulk of the extras revolve around deleted scenes and extra performances. The extra scenes feature material excised from sequences already in the film and a couple sequences left out completely. I didn't feel the film would have been hurt by the inclusion of any of them, but nor is any of this material of vital interest either. The deleted scenes total 21m:12s. The extra performances feature Money Mark (02m:44s), Tino Corp (05m:49s), and The Album Leaf (05m:11s). The theatrical trailer (01m:47s) is here, as is the Schaeffer Beer Commerical seen in the film (01m:01s). The commercial, dating from more than 30 years ago, looks decent for its age. One last extra, for those wishing to give a Minimoog a spin is a demo of Arturia's Minimoog V software, which is a simulator of the Minimoog synth made for computer use, knob twiddling and all. Trying to present a portrait of a music revolutionary in 70 minutes wasn't going to be easy, and many will probably find Moog doesn't get into topics they would have liked, or explain enough for newcomers. Worth a look if you're a follower of the bands that use Moog synths, but maybe a letdown for others. The DVD has some decent extras to go with a reasonable presentation of the film.